It was goodbye to Launceston this morning as we headed towards a place called Cradle Mountain in the north-west of Tasmania. We drove through some interesting scenery - like the weather, the views were ever-changing. One minute we'd be driving through green fields dotted with sheep and cows, baa-ing and moo-ing away quite happily, the next, mountainous terrain. One minute we'd be driving under sunny blue skies, the next, rain and sleet. This unpredictability continued throughout our journey over to the west. 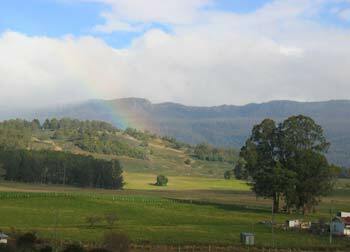 A rainbow pierces the sky en-route from Launceston to Cradle Mountain. After spending much of the day on the road, it was getting dark and cold. During the last 5kms before we parked up for the night, it had started to snow - gently at first but gradually more heavily, making visibility increasingly poor. We could see large patches of white on either side of the road where the snow had begun to settle. Under these icy cold conditions, we found the campsite's name reassuringly comforting: 'Cosy Cabins' (Ethel does not have an interior fan heater - or at least one that works!) which made us look forward to the last stretch of our journey even more. We eventually parked up at the powered campsite, 10kms from Cradle Mountain. This is the first time we've been in a caravan park where it's snowed. 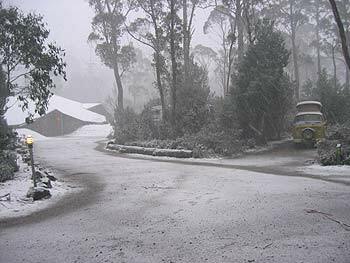 Heck, it might even be the first time that Ethel, the Kombi shivering in the corner there, has experienced snow. As we pulled up at the reception, we could see a freshly-made snowman. The temperature outside had dropped to about 8 degrees Celsius but with the added wind-chill factor, it felt a lot colder. We parked up, put the portable fan heater on to the highest setting and got the kettle on straight away then waited patiently (and hopefully) for the snow to become deep enough for a snow ball fight. And you thought Australia was all about hot, sunny beaches? 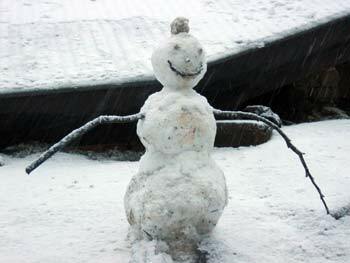 This snowman proves otherwise. Later on in the evening, Ian stepped outside to head to the toilets but reappeared seconds later saying "There are lots of paw prints in the snow around this van - and it looks like something with four feet!" He stepped back out, telling me to take a look, and very nearly stepped on the creature responsible - a possum that was standing right by Ethel's sliding door. The possum soon scarpered over to a neighbouring van whose owner had a large bread supply - I could see four or five of them feasting away, completely uninhibited. We were handed some bread by our kind neighbours and shared the fun of feeding and stroking these furry creatures. 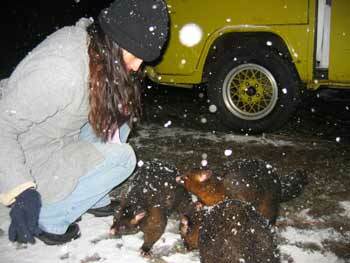 Once the bread had ran out, the possums followed us back to Ethel, where the feasting continued. I had some dried sultanas stashed away and they seemed happy with the new variety. These possums looked rather fat and I'm sure other travellers have offered them tid-bits in the past. It was great seeing them feeding - all five of them - as the snow fell onto their coats. Every now and then they would hiss at each other, protecting their food, but I made sure they all had a piece and prevented fights from breaking out. Peacemaker, that I am! After about 10 minutes in the snow with ice blocks as feet, we went back inside and stood next to the fan heater - it was freezing out there. I almost wanted to offer the little cuties refuge inside the van, but then I remembered what one of them did to Ian back in Sydney, and the fact that another was missing an eye suggested that this might not be the most sensible act of charity. Besides, they've got fur coats. 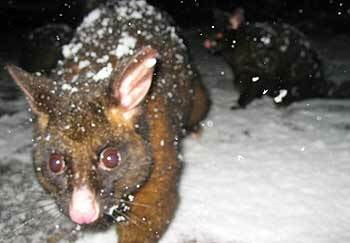 A snowy possum, following the camera.